On September 17th, 2012, the guided-missile destroyer USS Winston Churchill and other U.S. Navy assets conducted a joint counter-piracy exercise with the frigate Yi Yang of the Chinese People’s Liberation Army Navy in the waters off the east coast of Africa. This marks the first bi-lateral counter-piracy training exercise conducted between the two countries in history. The mission consisted of visit, board, search and seizure operations. 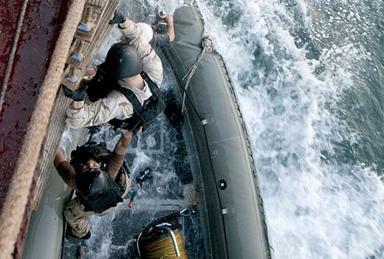 The cooperating elements practiced identifying, boarding and searching suspicious vessels, as well as responding to ships that had been hijacked by pirates. The focus was to hone the cooperation of the two forces in conducting these operations. The Winston Churchill acted as the mock-pirated vessel, and teams from both countries specializing in visit, board, search and seizure (VBSS) stormed the ship. Operating side-by-side, the combined force successfully completed the mission, assisting the marines who were playing distressed sailors. After the exercise, officers from both teams went over what went down and discussed how to better cooperate in the future. U.S. leaders shared expressed the value of coordinating exercises with foreign military outfits, especially in the context of the international operation to police the waters of the Indian Ocean. Surely, such an exercise was exciting for all participants: the United States and China are not the closest of allies, and recent Chinese aggression in Southeast Asia has many important allies of the United States alarmed. However, it’s excellent to show that nations can come together to participate in ensuring that such a vital body of water for the global community remains secure.